Kamala is the only female Magister in a brotherhood of magicians – except that most of them don’t know she exists and has accessed the secret of their power. Outsiders don’t know the secrets of the Magisters, so Kamala is a massive threat to their supremacy, being not only a woman, but not being as constrained by the rules that bind the rest of them to keep their secrets. Kamala has secrets of her own, and is forced to keep her powers hidden under the guise of witchery, the only other option for a woman with her abilities. She has proven to herself and her master that she can hold her own as a Magister, but the events unfolding before her test her will and her own self-belief. Friedman writes a powerful story – I was stunned by the darkness of the first book of this trilogy and was not disappointed by the tone of this instalment. 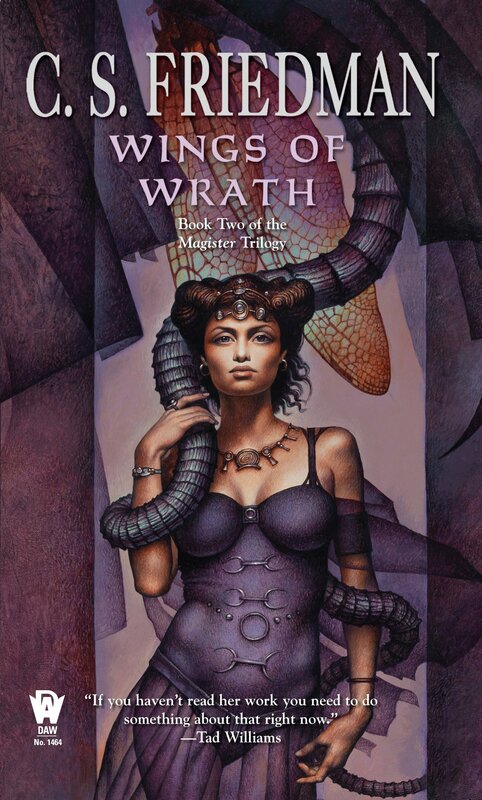 Wings of Wrath is deeply layered with strongly written characters and a detailed plot. The action is intense, the relationships potent, and the characterisation detailed and realistic. I really enjoyed Kamala’s unfolding personality as she realises she’s not as aloof as she believes herself to be, and the twining together of the various plot threads is both realistically done and exciting to read. While it’s been at least two years since I read the first book, it wasn’t all that hard to recall prior events, although a refresher read, or reading the second book immediately following the first would certainly be a better option for a more effective reading experience.